Emirates today celebrates the launch of three A380 destinations bringing its flagship three-class double-decker aircraft to them. Emirates brings first A380 services to South America and North Africa, and returns to Narita. 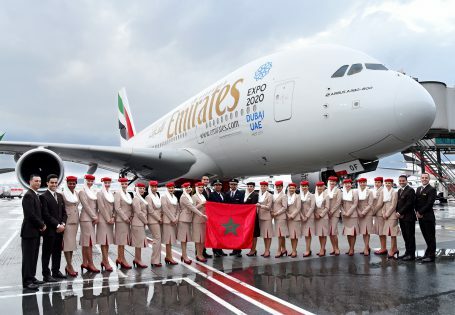 With this triple deployment, Emirates will be the first airline to operate scheduled A380 services in Latin America as well as to North Africa. In addition, the Emirates A380 service to Sao Paulo marks the airline’s 10th year of operations in Brazil, which began with daily flights between Dubai and Sao Paulo in October 2007. Emirates had previously served Narita with an A380. The reintroduction of this service and increase in capacity is in response to the healthy demand for travel between Japan and Dubai. Travellers and fans of the highly popular Emirates A380 will now have more opportunities to enjoy this iconic aircraft as Emirates now flies the A380 to 49 destinations on six continents. Early Sunday morning, from its hub in Dubai, Emirates flight EK318 set off for Narita, Japan. This was followed by flight EK751 to Casablanca, and then flight EK261 to Sao Paulo. On all three routes, the A380 replaces an existing Boeing 777 service. Emirates’ spacious A380 aircraft can transport up to 515 passengers per flight, and eight tonnes of cargo. All of the services launched today offer three classes of travel – First, Business and Economy, with generous free baggage allowance (up to 35kg in Economy, 40kg in Business and 50kg in First Class). The Emirates is the world’s largest operator of A380s, with 94 currently in its fleet and a further 48 on order. Since 2008, the airline has carried over 65 million passengers on its flagship aircraft.